I just sat through my first entire keynote by David Warlick. Although, I respectfully disagree with some of his assumptions, he was very very good. I hope one day David will accept my invitation to have a public conversation or a conference will feature us together on the same stage at the same time. Registration Now Open for CMK 2009! How does one possibly top a summer institute where Alfie Kohn, Peter Reynolds, Bob Tinker, Marvin Minsky and an all-star faculty joined educators from around the world to create remarkable learning adventures? Constructing Modern Knowledge 2009 promises to do just that! Registration is now open for the professional learning event of 2009! Constructing Modern Knowledge 2009 offers a world-class faculty and supportive environment for educators interested in exploring the intersection of creativity, collaboration, computing and powerful ideas. Learn more about CMK ’09 at this site. I’m off Monday to speak at the NSBA T+L Conference in Seattle. The virtual handout for the event is here. It may change before the end of the conference. ..and yes, the Democratic Vice Presidential Candidate is smarter than a fifth grader! (The kid is terrific too) Be sure to watch until the end! Here is my latest article to be published in a forthcoming edition of The Creative Educator magazine. Vanity Fair writer and widow of Tom Russert, Maureen Orth, wrote a charming article about a small school she built in the Colombian Andes while a Peace Corps volunteer in the 1960s. Last week she returned to the school to present the school named for her by the local villagers with 230 XO laptops from the One Laptop Per Child Foundation. Today, seeing how excited the children are about their small, green-and-white computers, which they are allowed to take home every night, is one of the greatest rewards I have ever had. I walked into the first grade classroom and had never seen kids so eager to learn. Their teacher, who had pooh-poohed the whole idea of computers and was on her way to retirement, was plunging right in. I have long been fascinated by experts, expertise and the commonalities between them. I have learned much about learning by being in the presence of people who are great at what they do. In fact, I believe that reality TV is a manifestation for our basic human desire to engage in apprenticeship experiences. The Sundance Channel just started broadcasting its fourth season of Iconoclasts. In the series, extraordinary people are paired to interact informally and we get to eavesdrop on the result for an hour. Clips from all four seasons may be watching online at http://www.sundancechannel.com/iconoclasts. 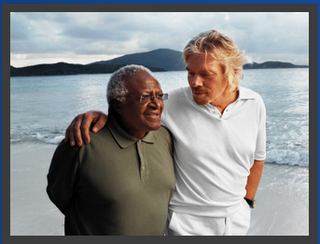 This season pairs people like Archbishop Demond Tutu and Sir Richard Branson; Clive Davis and Bill Maher; Tony Hawk and Jon Favreau. iTunes offers Season 2 of Iconoclasts , including six pairings like Dave Chapelle and Maya Angelou; Dean Kamen and Isabella Rosellini, etc… for $9.99 or as individual episodes for $1.99 each. I hope other seasons will be available on iTunes or DVD sooner rather than later. Care to Really Understand Federal Education Policy? In my humble opinion, Jo Boaler‘s, recent Education Week column, Where Has All the Knowledge Gone? The Movement to Keep Americans at the Bottom of the Class in Math, is one of the most important pieces of education journalism in some time. Is this just a coincidence? Can President Bush really have been so badly advised as to ignore almost all of the research that could have informed the report, or was there something more deliberate at work? How acceptable is it for a government to control the forms of knowledge that are released to the public? 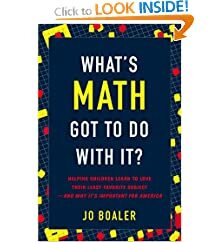 Dr. Boaler is a former Stanford University Mathematics Professor who clearly and succinctly documents how “science” and “research” are used as a blunt weapon by the United States Department of Education. Boaler describes how the President’s National Mathematics Advisory Panel was constrained from publishing the best advice for improving mathematics education. Such ideological interference in mathematics education is consistent with the Reading First mess at the center of No Child Left Behind. Over the past six months I’ve discovered the BBC television phenomena, Top Gear. I first heard about it when Jay Leno publicly criticized NBC‘s desire to produce an American version. Top Gear is hosted by three blokes who love cars, build insane contraptions, challenge one another to drive across the English Channel and tease one another mercilessly. Top Gear is an enormous international hit with its own magazine, children’s books, DVDs and international editions, such as Top Gear Australia. I’ve watched a couple of dozen episodes of Top Gear and have my DVR programmed to record new ones, not because I love cars or am even interested in them. I hate cars and would be pleased to never drive again. I watch the show for the hijinks, witty repartee between the hosts and because it is fantastic observing expertise. The primary host of Top Gear, Jeremy Clarkson, is also a columnist for England’s The Sunday Times and The Sun. Clarkson’s co-hosts, Richard Hammon and James May also write entertaining columns for British newspapers. During a recent trip to Australia, I thumbed through Clarkson’s most recent anthology of columns and found a stunning piece of writing about education, Schools are Trying to Break Children. All of us wrap up our children when it’s cold. We put them on booster seats in the car and make them wear helmets when they’re on a bicycle. We strive constantly to keep them out of harm’s way, and then we send them off to school so they can be tortured and killed. Apparently, schools the world over are a lot more similar than the international comparison wielding politicians would like us to believe. Read Jay Leno’s review of and affection for Top Gear.